One of the kids' favorite apps is Ansel & Clair’s Adventures in Africa. Roo and Jasper reviewed it back in summer 2011 and they still enjoy playing it, which in terms of apps is pretty darned impressive. In terms of educational apps, it's nearly unheard of! 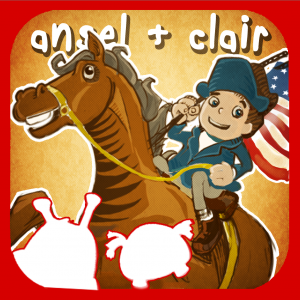 I was excited to hear that a a new title has recently been added to the series: Ansel & Clair: Paul Revere's Ride. Jasper, in particular, has an unusual affinity for the Revolutionary War and is obsessed with the "Shot Heard 'Round The World" from the America Rocks series. This seemed like it would be an obvious hit with him. This app is very, very interactive with plenty of animation, trivia, maps, minigames and even the ability to type your own notes into the Travel Log. (Jasper does not read or write much yet but Roo really liked that; her class did Lewis & Clark journals so she enjoys the historical documentation process.) Period music and licensed museum artwork add to the immersive learning experience. In accordance to the FTC Guidelines and WOMMA Code of Ethics, I am disclosing that I received a complimentary download code to facilitate this review. As usual, though, all thoughts are my own. My kids and I loved Oregon Trail and the Carmen Sandiego series, so I have a feeling we'd have loved this as well! More cool apps for us to check out when we get the ipad!! This looks like a good addition to our homeschool as well!